All Whaleyville homes currently listed for sale in Whaleyville as of 04/23/2019 are shown below. You can change the search criteria at any time by pressing the 'Change Search' button below. If you have any questions or you would like more information about any Whaleyville homes for sale or other Whaleyville real estate, please contact us and one of our knowledgeable Whaleyville REALTORS® would be pleased to assist you. "Beautifully remodeled home on over 11 acres, making for the perfect horse-lover's retreat or private oasis in the country. Step inside to find flowing hardwood floors throughout with a welcoming foyer and great views of the tranquil back yard. The family room boasts abundant natural light with access to the back deck, as well as built-in book cases and fireplace for chilly nights. Just off the family room is the newly renovated kitchen with plentiful cabinetry and counter space, stunning marble counter tops, large island perfect for cooking, dining, and entertaining, and stainless-steel appliances. Enjoy family meals overlooking the farm in the large dining room off the kitchen. The master suite boasts hardwood floors, gas fireplace, large walk-in closet, and newly remodeled master bath with tile shower, claw-foot soaking tub, and on-trend finishes. Included in the renovations of this home were the addition of two spacious bedrooms, each with plentiful sunlight. Relax on the back deck with two awnings or take a swim in the above-ground pool. The fully fenced yard is great for pets, and the patio with fire pit is ideal for relaxing on summer nights. The detached two-car garage offers abundant storage with space for work bench, and comes with a utility bathroom. The garage also features an overhead apartment with full kitchen and full bath. This would be a great space for a caretaker or rent it out for an income producing property. This property has a nice layout for horse enthusiasts, boasting numerous pastures with electric fencing, three-stall barn, tractor and storage sheds, and a large back pasture that would be great for trails, an arena, or additional pastures. Tucked away on a quiet street yet centrally located and within easy travel of Berlin, Salisbury, and Ocean City, this property has everything on your wish list. Be sure to ask for the Property Features List to see all of the renovations and special upgrades in this home." "Beautifully remodeled home on over 11 acres, making for the perfect horse-lover's retreat or private oasis in the country. Step inside to find flowing hardwood floors throughout with a welcoming foyer and great views of the tranquil back yard. The family room boasts abundant natural light with access to the back deck, as well as built-in book cases and fireplace for chilly nights. Just off the family room is the newly renovated kitchen with plentiful cabinetry and counter space, stunning quartz counter tops, large island perfect for cooking, dining, and entertaining, and stainless-steel appliances. Enjoy family meals overlooking the farm in the large dining room off the kitchen. The master suite boasts hardwood floors, gas fireplace, large walk-in closet, and newly remodeled master bath with tile shower, claw-foot soaking tub, and on-trend finishes. Included in the renovations of this home were the addition of two spacious bedrooms, each with plentiful sunlight. Relax on the back deck with two awnings or take a swim in the above-ground pool. The fully fenced yard is great for pets, and the patio with fire pit is ideal for relaxing on summer nights. The detached two-car garage offers abundant storage with space for work bench, and comes with a utility bathroom. The garage also features an overhead apartment with full kitchen and full bath. This would be a great space for a caretaker or rent it out for an income producing property. 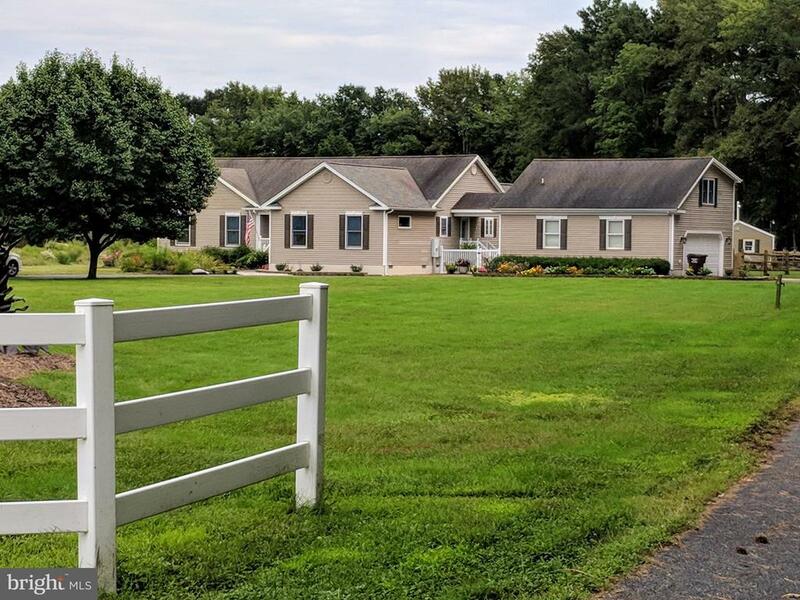 This property has a nice layout for horse enthusiasts, boasting numerous pastures with electric fencing, three-stall barn, tractor and storage sheds, and a large back pasture that would be great for trails, an arena, or additional pastures. Tucked away on a quiet street yet centrally located and within easy travel of Berlin, Salisbury, and Ocean City, this property has everything on your wish list. Be sure to ask for the Property Features List to see all of the renovations and special upgrades in this home." "Country living by the beach. This 4 bedroom, 2.5 bath home sits on over 5 acres featuring a fenced horse pasture with 2 ponds and a 2 stall horse barn with new metal roof. Other features include a large 2 car attached garage, multiple outbuildings, and a newer (owned) water treatment system. Home has been well maintained by the original owners who are including a 1 year home warranty. Enjoy summer nights on the large, rear deck surrounding the pool. Short distance to both MD & DE beaches!!" "Situated on just under 5 acres, this 3 bed/2 bath home is a great place for your family and animals to run and play! 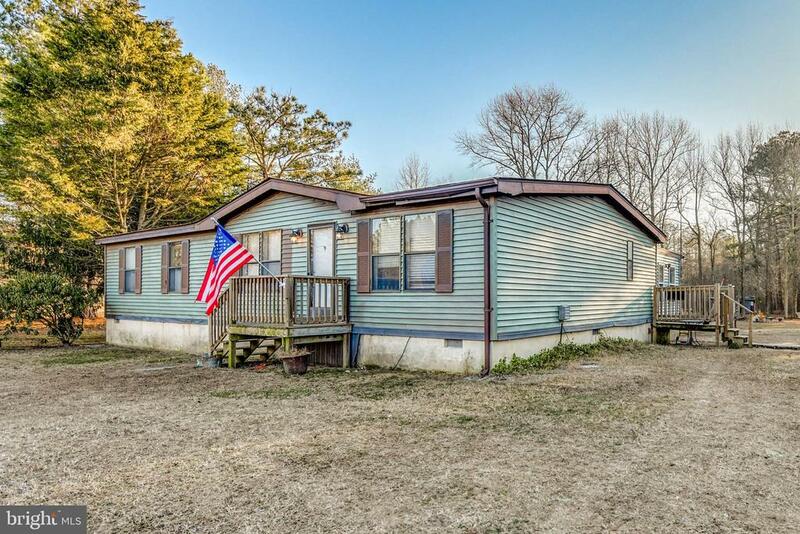 All the appeal of a quiet country setting, while still having quick access to main roads that will get you to Berlin, Ocean City or Salisbury in no time. Needs a little TLC, but a great buy!"